At a recent media event, I had the opportunity to visit with Bill Wilson to see what was new and shoot some of his high-end firearms—one of which was the CQB. Wait, what? I’ve had a CQB for a couple of decades, and it’s a brilliant pistol. So how can the CQB be new? Simple: time and engineering. If you take something that already works well and you improve everything on it using the latest materials and processes and if you use experience to adjust dimensions of parts so they work better with each other and also add in the changes shooters have asked for, you can call it a new pistol. The CQB is a full-size 1911A1, made with a carbon-steel frame and slide for the greatest strength and durability. It’s also available with an accessory rail or even with an aluminum frame and an accessory rail, but the standard-bearer and big seller for Wilson Combat is the all-steel CQB. 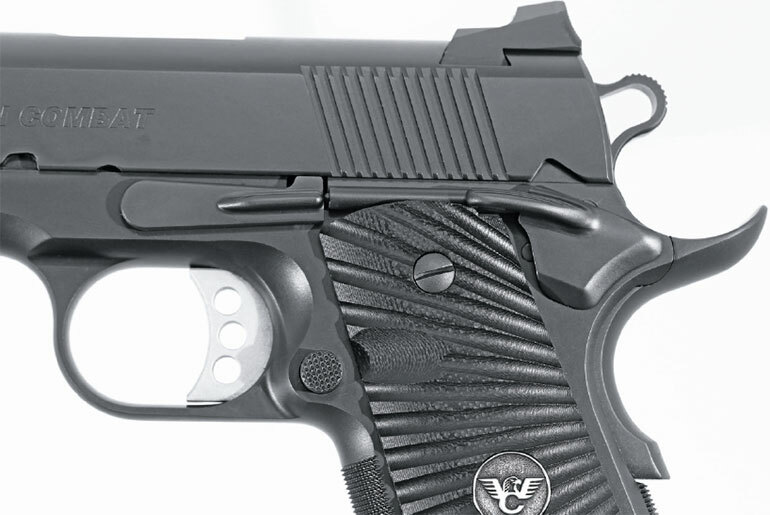 A few years ago, Wilson Combat made a big gamble. It invested in CNC machining centers, installed them in a state-of-the-art building, and brought all the slide, frame and barrel production in-house. Now the person who is running the frame CNC machining centers is across the aisle from the guy who is running the slide CNC machining centers, and they can compare notes in real time. If they have a problem, question, suggestion or improvement, they can both walk to the end of the aisle and talk to their supervisor because that’s where his office is. You can’t do that if you are getting your parts from suppliers. As a result, the slides and frames that arrive on the bench of a master pistolsmith—the guy who will be building your Wilson Combat pistol—will start out with a more precise fit than can be built later with parts that are less well fitted. And with less grunt work to do, the builder has more time to ensure every detail is correct, resulting in a gun with more accuracy, reliability and longevity already built in. Not that the ultra-precise CNC machining makes the pistolsmith’s job any easier. It still takes skill, experience and time to properly finish fitting and lap in the slide-to-frame fit. Barrel blanks are deep-drilled, honed, rifled, then turned on CNC lathes and chambered. The ones the pistolsmiths at Wilson Combat use are the same as the ones you might order from the company, except that the external fitting dimensions are left over-sized. Each barrel and its bushing, also made by Wilson Combat, are then exactingly fitted. One detail of the barrel and bushing fit that has changed is the extension of the barrel past the bushing—as in, there isn’t one now. 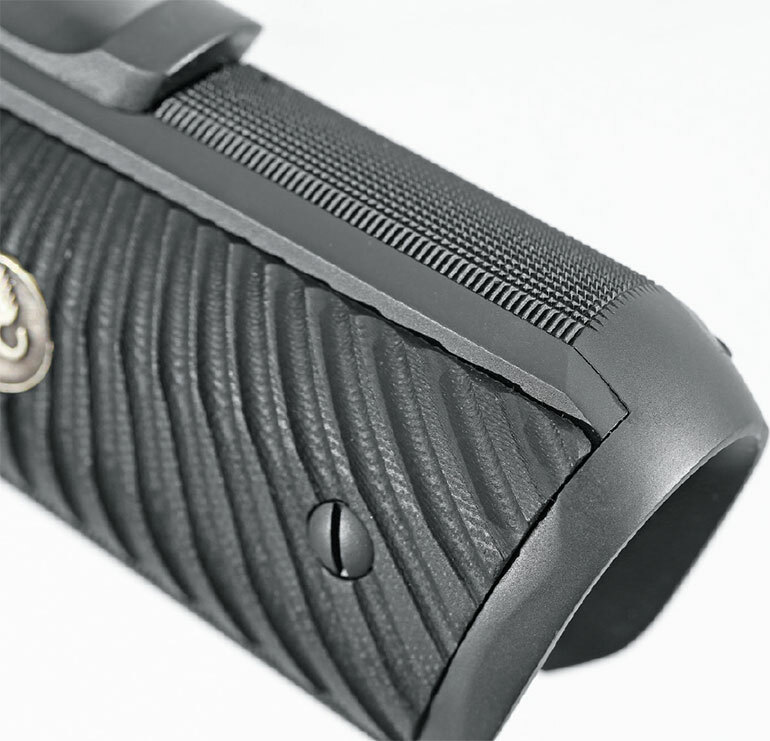 The modern 1911 look, which has the barrel flush to the bushing and then beveled, protects the barrel’s crown better. While you could say this is primarily a change due to aesthetic tastes, it’s also a change dictated by long-term feedback on the 1911’s performance that lets those who pay attention improve the tool. The CQB features a relieved and undercut area behind the trigger guard for a high hold, and the rear sight is a ledge-type that allows you to use it to rack the pistol. The sights are another example of incremental changes. When my CQB was built two decades ago, we were still using sleek, angled rear sights because we didn’t want them to get hung up on anything. Now the Wilson Combat rear sight (made in-house, by the way) features a definite ledge. It’s not enough to get hung up on anything, unless what you want or need to use the rear sight as a cocking tool. LAPD has long been teaching recruits to hook the rear sight on something sturdy and push the pistol away from themselves to work the slide if they have to clear a malfunction one-handed. In keeping with modern tastes, the barrel doesn’t extend beyond the bushing and is beveled to protect the crown, and the front sight is a fiber optic. The front blade is equipped with a fiber-optic rod—which has also become a popular sight option in modern times—so you can use that light-channeling advantage to speed up your aim. The frame also has received its share of modern improvements. The frontstrap has been aggressively lifted, with the juncture of the frontstrap and the trigger guard not just raised but also slightly recessed towards the magazine well. This lets you get your hand as high on the frame as is humanly possible, and the pistolsmith who built the CQB also made sure there were no sharp edges there. Below the lifted curve is checkering. This is precision-cut, with all the diamonds perfect, from the lift curve down to the front edge of the frontstrap and at the magazine well. Speaking of the well, my test sample came with the optional mag funnel, which is blended to the frame so you can have super-slick reloads. In a match, a fast reload is one way to win a stage. 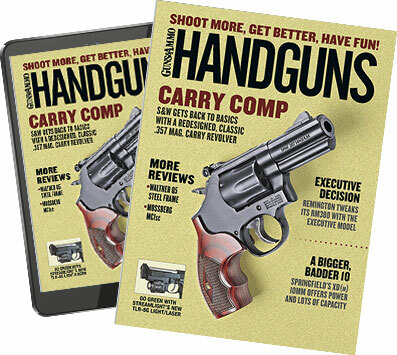 In real life, the need for a fast reload is a clue that things are not necessarily going as well as you’d like, and the optional funnel can help you get fresh rounds in your gun more quickly. The optional magazine well not only speeds reloads but also is rounded and smooth to prevent the pistol from printing under clothing. The mainspring housing is also precision-checkered. And if you opt for the optional mag well funnel, which I recommend, you’ll find the bottom of it has been left rounded and smooth. This is to help concealment, the smooth curve allowing clothing to slide off of the pistol and hang properly. The Wilson-made grip safety is precisely fitted to the frame, and the CQB that arrived here came with an ambidextrous thumb safety. I’m not too keen on ambis, simply because the offside lever usually binds against my trigger finger knuckle and makes it tough to shoot. 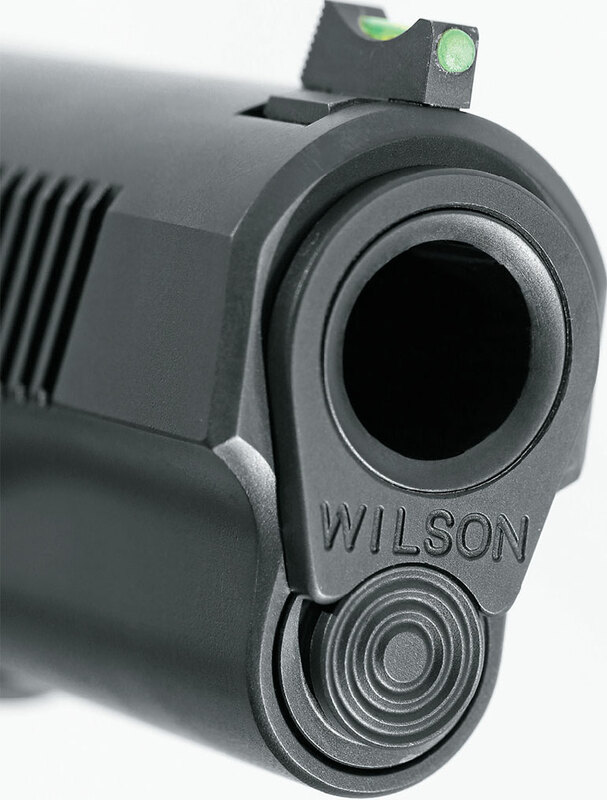 Wilson Combat worked on the design of the thumb safety to make the offside lever useful but as unobtrusive as possible. I found it a lot easier to work with, even though it still was a noticeable presence on my knuckle. If you don’t want an ambi safety, ask for a single-side safety. And to top it all off, the CQB sent to me had one more improvement: the finish. Wilson Combat puts a PVD finish on the CQB. Physical vapor deposition is a process where the parts are locked into a cabinet, the cabinet is evacuated to a hard vacuum, and then the depositing material is vaporized and allowed—nay, encouraged—to coat the parts. For the CQB, the material used is DLC, or diamond-like coating. Diamond-like? Yes, the DLC is a carbon deposit that self-coats in a hard, crystalline-like surface layer. The DLC layer is only a few microns thick, so it doesn’t change any dimensions. This is a harder-than-a-file layer. It is also very low friction and resists corrosion to an amazing degree. It should be obvious, however, that once you PVD/DLC a part, it is done. You can’t make any changes. So make absolutely sure you have spec’d your CQB the way you want it to be, because the only way to make changes is to remove the DLC, and that isn’t easy. The first thing I noticed in testing was that this was a fast barrel. The velocities with each load were higher than I had seen in other 1911s. I asked Guy Joubert, head of product development at Wilson Combat, if they had found some new secret process that made barrels zippier. No. They just make them as precisely as humanly possible. So this is just a fast barrel. And an accurate one. 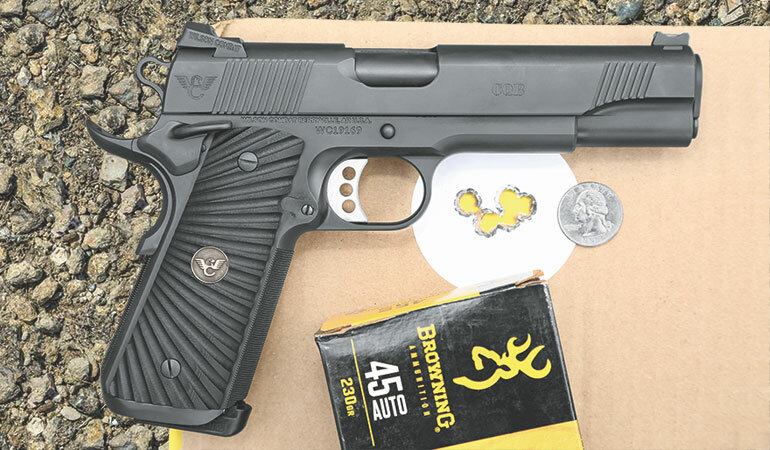 Each Wilson Combat 1911 is test-fired for function and accuracy before it is shipped. I’ve seen a test shooter sit down and promptly punch out a passing group—and by passing I mean a five-shot group at 15 yards you can cover with a quarter. With a .45 ACP. Once I had done my regular 25-yard testing, I tried the Wilson test. I came close but couldn’t quite manage it. Some people are going to balk at the price. What do you get for your investment? You get a brilliantly fitted and built 1911 that will never fail. It will have greater longevity than pretty much anything else you own. On a recent visit I asked Bill Wilson what the accurate service life of a pistol like the CQB is. “Fifty thousand rounds,” he said. I think he’s being pessimistic because I have lesser pistols that have eaten twice that and show no signs of losing accuracy. But let’s go with his figure. At the lowest cost of brass-case 230-grain FMJ, 50,000 rounds adds up to $14,000. The cost of the CQB is a fifth of that, and if you think you are losing accuracy, you can always send your CQB back for a freshening. More likely, you’ll be leaving your CQB in your will to your heirs, with plenty of service life left on it. Quality lasts.